Eos Airlines flies Boeing 757s with cabins configured for just 48 first-class seats between New York JFK and London Stansted Airport. Each Eos 757's seat folds down into a full-length lie-flat bed and the staggered four-across seat arrangement makes sure every passenger has direct access to the aisle. Airporthassles and flight delays have become a way of life to everyone who fliesregularly on business. But transatlanticroad warriors are increasingly finding there is something they can do aboutit--for a price. A new breedof airline will fly you between major U.S. and European cities in considerable comfortand privacy on an airliner filled only with fully reclining business-class seatsor first-class mini-suites. There are no screaming kids. Dependingon the airline you choose, you?ll find your plane has only 40 to 100 seats. Theseairlines charge relatively high fares, but their rates are often lower than thebusiness-class or first-class fares charged by other airlines flying to thesame places with packed 747s. The conceptof all-premium-class service ?is not entirely new,? said Doug Abbey, a partnerin The Velocity Group, an aviation consulting firm. ?This is what the Concordedid.? Concorde passengerseats weren?t very comfortable, because Concorde cabins were cramped. However, ?what drives this market is the value of one?stime,? said Abbey. ?People pay top dollar for time. Absent any incrementalimprovement, all airlines can do is make it more comfortable for you.? All-premiumairlines strive to do so by offering door-to-door limousine service; expresslanes at airport security checkpoints; lounges where passengers can dine andreceive spa treatments; and facilities at destination airports for passengersto sleep and shower before meetings. The latestservice revolution began in June 2002. After the September 11 terrorist attacks,Lufthansa realized that although economy-class traffic on its Dusseldorf-Newarkflights had largely fallen off, business-class passengers were still flying. Rather thandrop the service completely, Lufthansa contracted Swiss charter company Privatairto replace it with an all-business-class flight, using a long-range model ofthe Boeing 737-700 called the Boeing Business Jet 1 (BBJ1). Privatair installed44 seats in the aircraft. ?Theservice was very closely watched by the entire airline industry for the firstyear,? recalled Lufthansa spokeswoman Jennifer Urbaniak. ?It was highly successful.? Sosuccessful was it that Lufthansa asked Privatair to operate all-business-classflights on the Munich-Newark and Dusseldorf-Chicago routes too. Privatairoperated the Munich service with a BBJ1 and the Chicago flights with an A319LR,a version of the Airbus Corporate Jet (ACJ), Airbus? response to the BBJ1. Lufthansais returning to three-class service on the Newark-Munich route, using its ownA330 widebodies. However, the Privatair BBJ that the A330s replace will startoperating all-business-class service in October between Newark and Frankfurt. 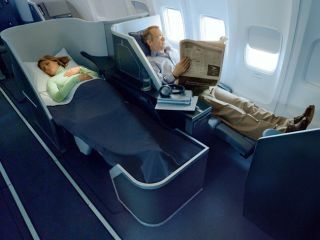 The successof the Privatair experiment has spawned a clutch of premium-class airlines onother major transatlantic routes. U.S. carriers MAXjet Airways and Eos Airlinesserve London from New York, as does British airline Silverjet. MAXjet alsoflies to London from Los Angeles, Las Vegas and Washington, D.C.
Frenchairline L?Avion serves New York from Paris. Theseairlines are still tiny, but their single-minded pursuit of high-farepassengers has begun to concern even the biggest European and U.S. airlines. Last week,American Airlines announced it would begin serving StanstedAirport from New York JFK. This appears to be a response to MAXjet?s andEos? success at Stansted, said Abbey, whose firm numbers MAXjet among itsclients. VirginAtlantic Airways and British Airways have announced plans to launch all-business-class flights. Under thenew Open Skies agreement between the United States and the European Union, bothplan to serve U.S. destinations from various European cities. SwissInternational Airlines--a Lufthansa subsidiary--and KLM have also contractedPrivatair to operate all-business-class services to the U.S. Privatair flies aBBJ1 for Swiss between Zurich and Newark. It operates a BBJ2--a long-rangeversion of the --between Amsterdam and Houston for KLM. Thepremium-class trend is now moving to Asia. Japan?s All Nippon Airways has begunflights to India with 737-700ERs which have some economy-class seats but aremainly configured for business-class passengers. Can the newbreed of all-premium-class airlines stay the course? One problem is that their servicesonly appear feasible on routes that generate substantial business traffic. ?We foundthese flights only work between particular cities,? said Urbaniak. ?There has tobe a common industry tying both cities.? Dusseldorf lies at the center of Germany?s Nordrhein-Westphalia region, which boasts 40 percent of the country?s industrialbase, including its pharmaceutical and high-tech industries. Newark is at theheart of New Jersey?s pharmaceutical industry. Chicago is a high-tech center. Small premium-classairlines can?t compete with the power of the big carriers? loyalty programs. Whenthey have to cancel flights, they often don?t have later flights on which they canre-book passengers--but major carriers usually do. They operate frequentthree-class widebody flights between most big U.S. and European cities. But all-premiumservice might cause branding confusion for big airlines, said Abbey. ?Concordewas separately branded and that needs to happen here if they?re going tosucceed with an all-business-class product.? Ultimately,the routes on which the new breed of premium-class airlines are operating areso large that ?I think this is something that?s just starting,? said Abbey. ?Ithink Virgin?s primarily a threat to BA,? not Eos.